I hope that you have enjoyed visiting my website, before leaving please permit me to tell you a bit about myself. I have spent all my working life in the construction industry which has provided me with the vehicle to travel the world, climb a few mountains and take lots of photographs along the way. I still visit and climb in the Alps, I have climbed in East Africa and the Greater ranges of Nepal and Pakistan along with the lesser known Zagros mountains of Iran and the Al Hajr mountains of the Arabian Peninsula. I have lived and worked in East Africa, most countries of the Middle East and SE Asia and the rarely visited Falkland Islands. I am an ex-President of Lancaster Photographic Society, a double Associate of the Royal Photographic Society, a member of the Outdoor Writers and Photographers Guild and a holder of the International Mountain Leader Award. I am also a past President of the Austrian Alpine Club(UK) OeAV Sektion Britannia. My business interests are best decribed as anything to do with mountains and photography. Please get in touch if you have any specific requirements. Thank you for visiting. Been off circuit for a while with niggling illnesses particularly Sciatica which is a mountaineers worst nightmare and totally debilitating. Anyhow trying to do my best with getting out and physio including acupuncture, but sadly not fit-enough, so no snow-shoeing this year. 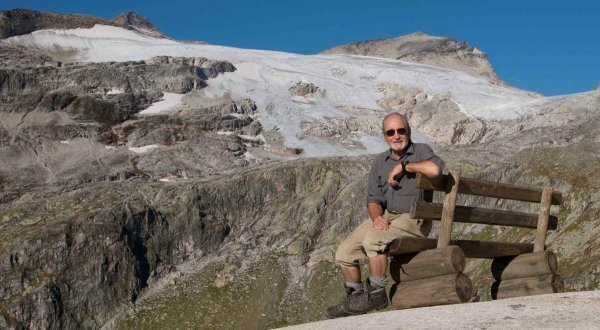 For the summer I will have our usual Gentle Tour for Austrian Alpine Club[UK] seniors, this time we are back to the Wipptal valley on the Brenner. Thereafter, I have a small group of seniors for a Via Ferrata Tour in the Rosengarten and Vajolet Towers area of the Dolomites famed for the opening scenes of Sly Stallone's film Cliffhanger where the young lass falls to her death when her harness comes apart. This will be followed by a few days in the Stubai near the fabulous Tribulaun mountains for guidebook purposes and update of my Trekking in the Stubai Alps guide. Then its back home. Thats it for the moment, apart from chasing steam trains with my friend Jon Brook at Bentham Imaging and other photography projects!